In last year’s Caldecott Honor winning Leave Me Alone by Vera Brosgol, an old granny tires of chaos and deafening noise in her overpopulated house and escapes through a secret door, only to find out that life in another region offers up the same obstacles as those experienced in her domestic environs. The people residing in the fictional village of La Paz in Carmen Agra Deedy and Eugene Yelchin’s The Rooster Who Would Not Be Quiet, like Brosgol’s overheated guardian, need some rest and relaxation. The problem with this proposition in Deedy’s book is that innocuous intent can often result in dire consequences. For all its deadpan humor and amusing underpinnings this allegorical story is a thinly veiled cautionary tale about foolhardy concession and the abuse of power. Put in more basic terms its conforms to the tenets of a timeless adage, “You don’t know what you have until it’s gone.” The book’s original title was The Noisy Little Rooster, but the alteration is so much better attuned to the work’s unmistakable theme. 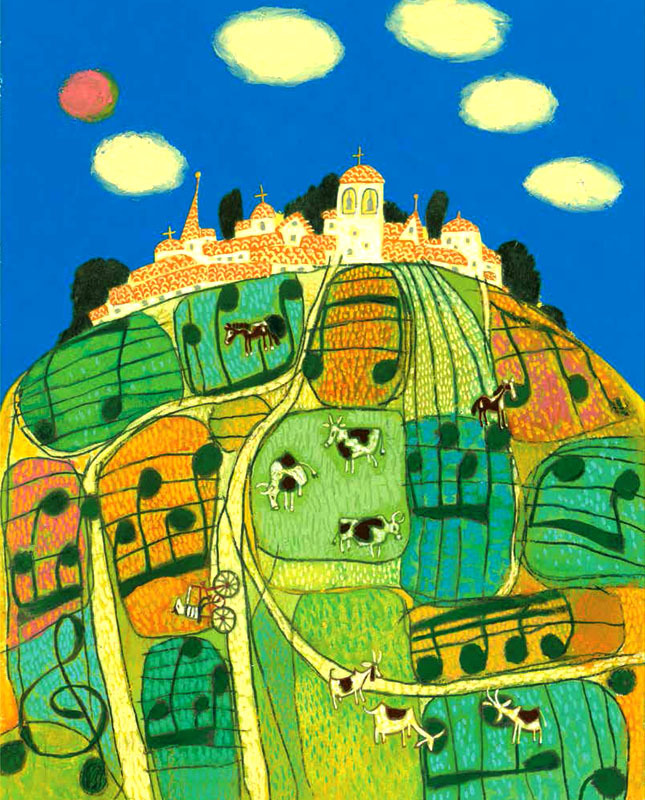 The pictorial response to Deedy’s Once there was a village where the streets rang with song from morning till night is a quilted countryside at the forefront of a cluster of thatched buildings, a few of which are chapels. Woven into the many plots, distinguishable by color are musical notes, depicting a blissful hamlet, unencumbered by curtailment of any sort. This lyrically acoustic Shangri-La is a veritable cornucopia of sound, all converging in and around a town square. 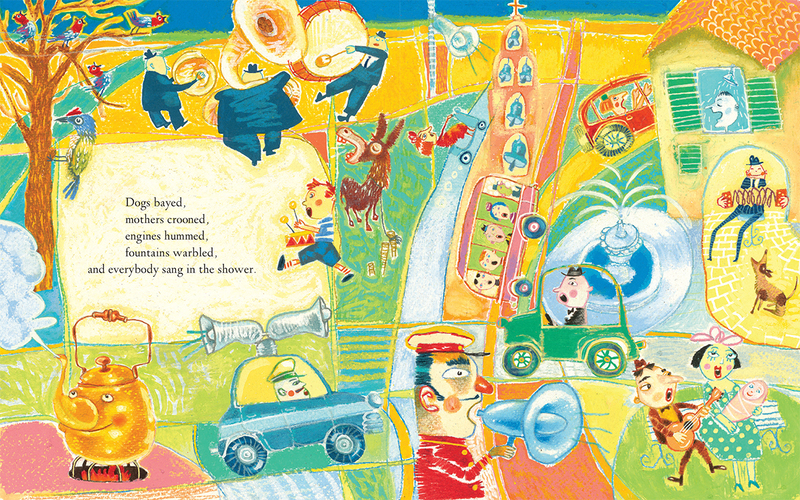 Albeit, some is of the bombastic variety – a man shouting into a bullhorn, a car with loud speakers passing through, church bells peeling and a boy marching to his own drum beat, other reverberations are suffused with more soulful cadences, such as a man playing an accordion, bus passengers strutting their choral prowess, birds singing in a tree, a married couple singing and playing guitar on a park bench and even a man singing in a shower with open window. A tea kettle contributes a signature toot to the cacophony, but more natural sounds like water gushing from a fountain or a goat neighing complicate this antithesis to the pastoral lifestyle. Yelchin’s mixed media eye candy applications were created by oil pastel, colored pencil, gouache and acrylic and the polychromatic double page canvas are vigorously applied in kid friendly mode. Alas, like the denizens in Ron Barrett’s Cloudy with a Chance of Meatballs too much of a supposedly good thing on an everyday basis will render this propensity stagnant. The residents of La Paz tired of the constant sensory chaos and finally decided to serve up their Mayor with his walking papers. Yelchin humorously visualizes this with an index finger extended, ordering the town’s chagrined highest ranking official to quit the premises, after a family of four and even their canine can no longer endure the deafening rumpus. A short time after the expulsion the village people hold an election and elect “Don Pepe” who ran on a platform of quietude. Yelchin’s illustration of the new Mayor, holding his finger over his mouth and wearing a musical note badge with a line through it is a hoot as are the throng of happy citizens and a smitten dog who have no idea what they are getting into when they hand him a landslide victory. The day after his win a polite sign is posted at the village square: “No loud singing in public, por favor.” In a pointed denunciation of how a little power can lead to a dictatorship, the author crosses off vital words on four signs to show that the common perception of censorship is benign compared to what Don Pepe has decreed, effectively eliminating singing entirely and demanding silence. 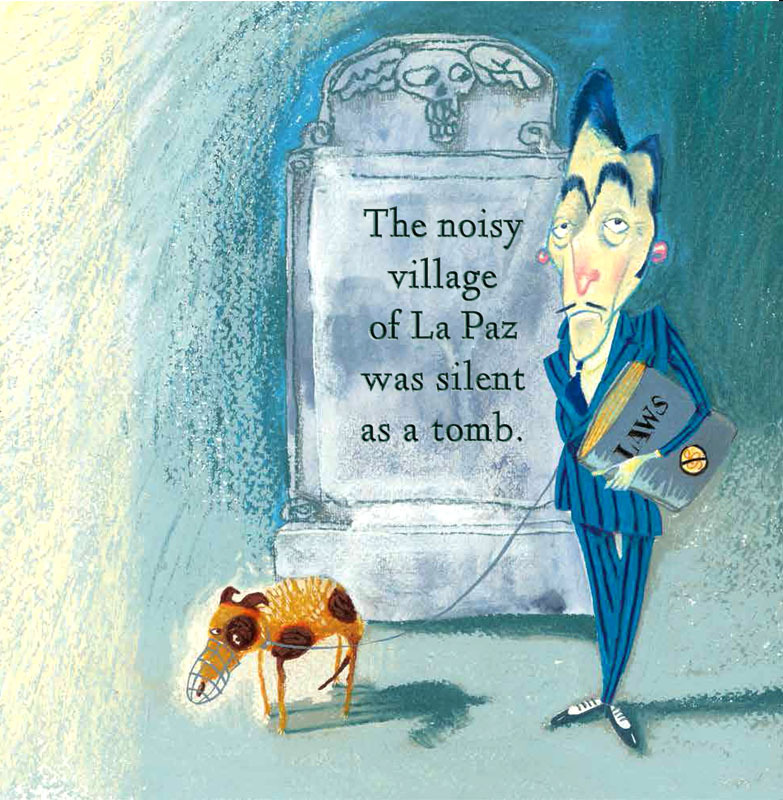 The illustrator’s pictorial depiction of a tombstone displaying the sentence The noisy village of La Paz was silent as a tomb includes an austere pose by La Paz’s newly minted despot holding a leash attached to the same dog we’ve seen, but now muzzled and unable to bark. In the most provocative depiction of a tea kettle since Disney’s animated musical Beauty and the Beast, the previous free-spirited whistler is only one of the bronze-colored kitchen ensemble bullied into reticence, symbolically conveyed by the illustrator’s sinister portraiture of the taciturn autocrat looking through a window. The normal manner to deal with oppression and the loss of individual rights of course is to relocate. Wielding musical instruments a small band head off defiantly making a racket, consummating their departure under an Adios banner. Others remained behind, unwilling to cut the cord with such finality. Instead asserts Deedy, they learned to “hum.” Still others contented themselves with a good night’s sleep. Yelchin’s color potpourri in kid friendly design delightfully conveys the societal clash between the daring and the demure. The entrance of the title character, one most previously renowned in a 1958 Caldecott Medal winning adaptation of Chaucer’s “The Nun’s Priest’s Tale” by Barbara Cooney, occurs seven years later, seven very quiet years asserts Deedy. A rooster (“a saucy gallito”) wander into the village by way of a “fragrant mango tree” where he roosts with his family: a hen and brood of chicks. 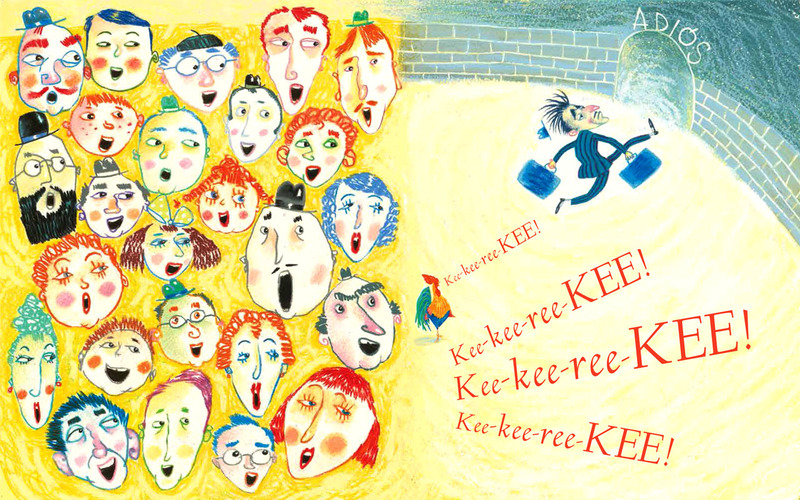 His aural calling card, kee-kee-ree-Kee recalls the timid giraffe’s exclamatory Treep treep troo-lee in Deborah Freedman’s 2016 picture book Shy, where the book’s main player bears striking similarity to those in The Rooster Who Would Not Be Quiet who prefer not to make any waves. The illustrator gives his majestic rooster peacock-like feathers in a sublime replication of the stunning cover tableau in the first confrontation with the tyrannical Don Pepe, who meets the Rooster because the mango tree grows beneath his window. The Mayor reprimands him for singing and vows to cut down the tree after the gallito tells him that this sweet sapling makes crooning irresistible, even if the tone will be less cheerful if the tree is taken down. Kee-kee-ree-KEE! sings the rooster confidently alongside the fallen tree, (An exquisite splash of evergreen) as the obstinate town leader asks why he is still singing with the mango tree razed. The gallito answers that he still had his hens and chicks, and that alone is a reason to warble. Don Pepe takes off the gloves and asks if he will sing when he is separated from his family. The gallito answers that the song may be lonelier but he’ll still sing it. Behind bars comes the all-too-familiar strain, Kee-kee-ree-KEE. Don Pepe is more than exasperated to hear this feisty fowl stay the course, and again inquires how this is possible. This most determined of birds cites nourishment as the reason to continue as the Mayor grits his teeth in a face to face standoff Yechin depicts comically. When Don Pepe intimates that the incorrigible rooster may be deprived of nourishment, he is answered that the song may be a hungrier one, but it will be sung nonetheless. Yet the singing continues, which drives the irritated noise policemen even more over the edge when the gallito cites the sun shining as a reason to continue. Don Pepe asks what will happen if he is moved into darkness to which the irrepressible crusader for freedom of expression again admits the song will be a darker one, but it still will be negotiated. Yelchin’s signature depiction of this noble bird is awash in orange-yellow sunlight in the book’s most stirring tableau. But that time the previously muzzled crowd are all talking in defiance of the long standing edict and the Mayor takes his turn in exiting through the ‘adios’ portal, as the gallant bird croons away. The melting pot of color servicing the celebratory return of a musically active village recalls in spirit the monochrome parade near the conclusion of Robert McCloskey’s beloved Lentil, where everyone takes a hand in the musical renaissance. The last page is unquestionably the most moving of all, as Deedy connects the free-spirited tendencies of roosters, who will tenaciously defy any attempts to compromise their desire to be heard, with children, who are urged to speak with a singular voice, even after initial quietude. 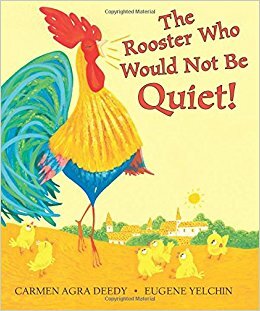 The Rooster Who Would Not Be Quiet is a vivacious, invigorating and often dynamic picture book that relates a captivating folk tale-like story, but more importantly cuts through reluctance and indecision, guiding young people to their full potential. Here’s hoping the Caldecott committee will honor Yelchin’s alternately jocular and plaintive art in the sublime service of one of 2017’s most inspirational picture books. Note: This is the eleventh entry in the 2017 Caldecott Medal Contender series. The annual venture does not purport to predict what the committee will choose, rather it attempts to gauge what the writer feels should be in the running. In most instances the books that are featured in the series have been touted as contenders in various online round-ups, but for the ones that are not, the inclusions are a humble plea to the committee for consideration. It is anticipated the series will include in the neighborhood of around 30 titles; the order which they are being presented in is arbitrary, as every book in this series is a contender. Some of my top favorites of the lot will be done near the end. The awards will be announced in mid-February, hence the reviews will continue until around the end of January or through the first week of February. Sam, I am speechless after reading your latest comprehensive investigation. The art is stunning and the story sounds perfect for this time, politically speaking. Where did you find that Dickinson poem? It really fits. This book has winner written all over it. Thanks so much Ricky! I chanced upon the poem, though Dickinson is one of my favorites. A fascinating entry, Sam, so well presented. Social engineering often fails badly, due to animate creatures not being machines readily engineered for the best. 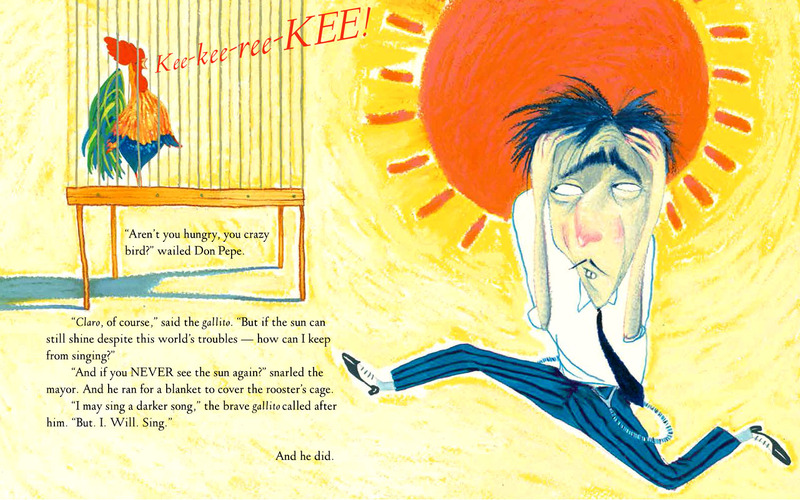 This lighthearted tale carries a lovely weight. Jim, that is a superlative point you make, how totally applicable it is in this instance. And yes, this seemingly innocuous story is in teh end as weighty as any children’s book methinks. Thank you so much as always for the much appreciated engagement and very kind words. Happy to see this book in your lineup Sam. Your effort in its behalf is as heroic as this Pied Piper of the bird world. The illustrations are handsome and lively. Ha Frank! That comparison made me smile! Thanks for the kind words. Sam, don’t know if you have seen the Kirkus list, but the Rooster is there as it was from other book institutions. One of my favorites. Karen, I did indeed see it today!!! This book is really on a roll!!! Thrilled to hear it is one of your own favorites too! on November 21, 2017 at 4:59 pm | Reply John R.
Always a unique book when a lesson is learned with exquisite art. Wonderful review, had me hanging on every word. So true what you say John. Thanks so much for the kind words. Terrific review. This is a beautifully written and illustrated book. I am hoping it is rewarded. Thanks so much for stopping by Steve! The book seems to be building quite a bit of momentum! 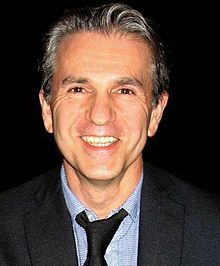 I enjoyed all your typically thoughtful reference points in film and literature. 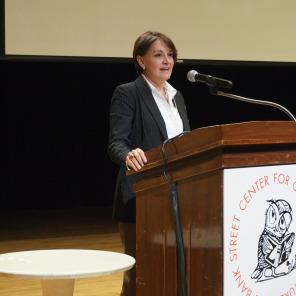 Your presentation is deep and erudite, your focus a superb children’s book. Thanks so very much for the exceedingly kind words Peter!!! Happy Thanksgiving! !